For today’s Daily Create, I had to “find something that is not there and show us in a photo or two.” Keeping that in mind, I decided to go with an all-time classic. Designed in 1934 by an artist in Sweden, and popularized by a British mathematician two decades later, the Penrose Triangle is the defining example of what is known as an “impossible object,” a type of optical illusion where a two-dimensional shape can be projected in such a way, that someone can purposely misinterpret it for one with three dimensions. 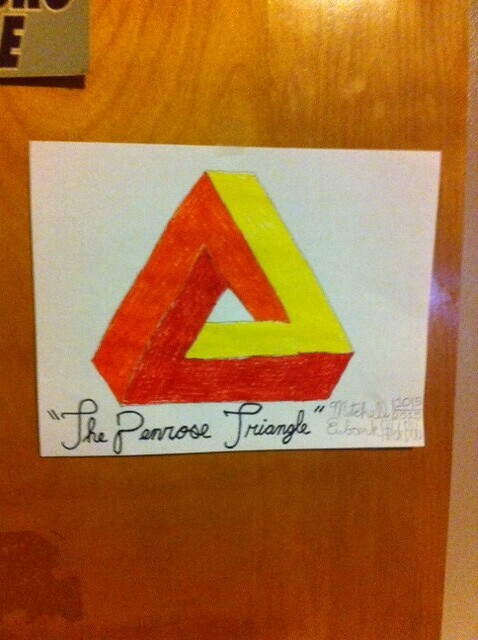 I constructed my own Penrose Triangle using Crayola markers and a pencil, on a piece of print paper. The red, orange and yellow color scheme fits my website’s design, considering the use of chrysanthemums in the background. As for step-by-step instructions, I decided to keep things as simple as I could, and drew the original triangle onto the paper, before adding in the color. It was tough to use the black marker for the first few attempts, so I settled for a pencil, instead. As soon as everything was set up properly, it was time to color in the spaces. As mentioned before, I went with the red/orange/yellow coloring scheme that most of my site is based on, making sure to be as faithful to the source material as possible, while still keeping to my own tastes. Once I completed my triangle, I taped it to my bedroom door, and took a picture of it with my iPhone. After that, I uploaded said photo onto my computer, sent my entry over to Flickr, as well as the TDC Twitter feed, completing one of my six Daily Create challenges over the next two weeks.